Some Congressman, like George Holding, have continually attacked the ACA. They don’t understand that the ACA has reined in many unfair practices of insurance companies that especially hurt women. Many women are only able to afford and qualify for insurance and get coverage now thanks to the ACA. There is even a name for the unfair pricing that insurance companies commonly imposed on women – gender rating, the practice of charging women different premiums than men. You’ll also be surprise what many insurance companies called ‘pre-existing conditions’ for women. Women were charged significantly higher rates throughout the country. Before ACA, in states that have not banned the practice, the vast majority, 92%, of best-selling plans gender rate. Can’t trust companies to do right thing. Maternity care had been excluded from most individual plans. In fact, only 3% of these plans covered maternity services. (Source: National Women’s Law Center) Add-ons were expensive or limited. Starting in 2014 – private insurance plans could no longer deny coverage based on pre-existing conditions, and examples of common pre-existing conditions for women that insurance companies refused to cover were previous pregnancy, cancer, depression diagnosis. Preventing insurance companies from blocking common conditions and stopping gender rating are some ways that ACA stopped insurance companies from cheating women and their families. Trump’s December 2017 move to repeal the ACA’s individual mandate could hurt the law’s insurance marketplaces because fewer young and healthy people may buy coverage, leaving an older, sicker, and more expensive pool behind. This would cause a cycle of more people leaving due to increased costs, and getting inferior health insurance. This cycle is explained in “With the individual mandate repealed, three things to expect,” Tennessean, 1/10/18. The mandate repeal goes into effect in 2019. In 2019 alone, premiums are expected to go up by $1433 per person in NC [Center for American Progress]. Many women cannot afford such a large increase. Many women can barely afford ACA now. This is where one person’s decision to go without health insurance coverage shifts costs onto other people. Massive premium increases cause some in that market to involuntarily lose coverage and causing those who remain to bear higher costs. Women and men who need h/c will not be able to pay for it. The CBO, Congressional Budget Office, is nonpartisan budget-scoring agency. CBO has estimated that the departure of healthy enrollees from the individual market spurred by repeal of the individual mandate will increase individual market premiums by 10 percent. However, the projected premium increase in individual unlucky states is much higher. The estimated increase in 2019 in NC is 17.80%! To make leaving the ACA coverage more attractive for healthy people, and therefore to make leaving ACA more likely, the Trump Administration is expanding access to skimpy short-term health insurance policies, as an alternative to the Affordable Care Act. “This change would affect more people and cost the government more money than the administration estimated, an independent federal study says,” according to “Trump’s Plan for Cheaper Health Insurance Could Have Hidden Costs,” New York Times, 5/15/18. These plans are not regulated by the Affordable Care Act’s consumer protections which state that health insurance plans must cover certain services, including prescription drug costs or maternity coverage, and other basic health needs. So a lot of these short-term plans are offering insurance in name only, and are actually just junk. As people opt out of plans with good coverage and opt for these junk insurance plans, the marketplace will destabilize, again leaving sicker people in the pool, causing premiums to be more expensive. Another major attack on women’s health care is the “Gag Rule” introduced by the Trump administration on May 17, 2018 to the Office of Management and Budget, OMB, prohibits medical personnel from honestly answering their patients. 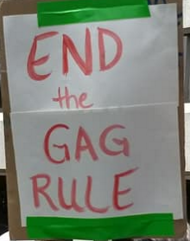 The Gag Rule also would cause clinics to close by taking away federal Title X funding from clinics all over the country. Title X is a federal family planning program, the only one dedicated solely to providing individuals with comprehensive family planning and related preventive health services. Closed clinics mean fewer patients have local access to health care. Young women, rural women, low income women will lose access to wellness exams and comprehensive contraceptive services. These women plus men will lose access to screenings for cancer and sexually transmitted diseases (npr, all provided by Title X). It also means fewer jobs in these communities, and fewer jobs have a bad ripple effect – fewer jobs mean less money in the community which will hurt other local businesses. Next effect of repealing the ACAs individual mandate is: fewer people insured, higher insurance premiums, sicker population – but monetary savings for federal government. Not worth our lives. The repeal of ACA’s individual mandate and addition of junk health plans will raise the number of uninsured people and deny women basic healthcare. Prices too high in NC, and women make less money. Plus, the recent imposition of this new and terrible Gag Rule is an attempt to take away women’s basic rights period. This entry was posted in ACA, discrimination, gender rating, health care, Obamacare, Obamacare, poverty, Rural women, Title X and tagged ACA, discrimination, gender rating, health care, Obamacare, poor women, poverty, Rural women. Bookmark the permalink.